This is the last, historic recording made together by the celebrated traditional mbira partners, Cosmas Magaya and Beauler Dyoko. 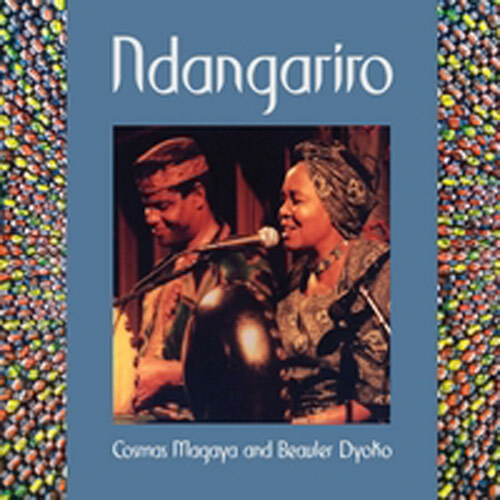 Ndangariro means remembrance, reflection on past events, and this album is offered in tribute to the great Ambuya (Grandmother) Beauler Dyoko, the first female Zimbabwean recording artist, who passed away in 2013. She is greatly missed by fans of traditional Zimbabwean music. Cosmas Magaya, also a long time giant amongst Zimbabwean mbira players, first met Beauler Dyoko in the 1970s, and the two legends formed a friendship that has lasted these many years. Between 1994 and the present, they have also delighted many audiences throughout the US, Canada, and Europe as a performing team. In this, their final album, you will hear the expert mbira playing and lively vocals that have delighted many audiences throughout the US, Canada, and Europe as a duo. Kutsinhira recommends that you buy the physical 6-panel CD – for its beautiful photographs, liner notes and translation by Cosmas Magaya, and general historical value. All proceeds from sales go to Cosmas Magaya and to the family of Beauler Dyoko.